Reju-u contacted us to design their new salon room for their new business venture - FACIAL TREATMENTS! The Brief was to be calming, warm, minimalistic and homely. 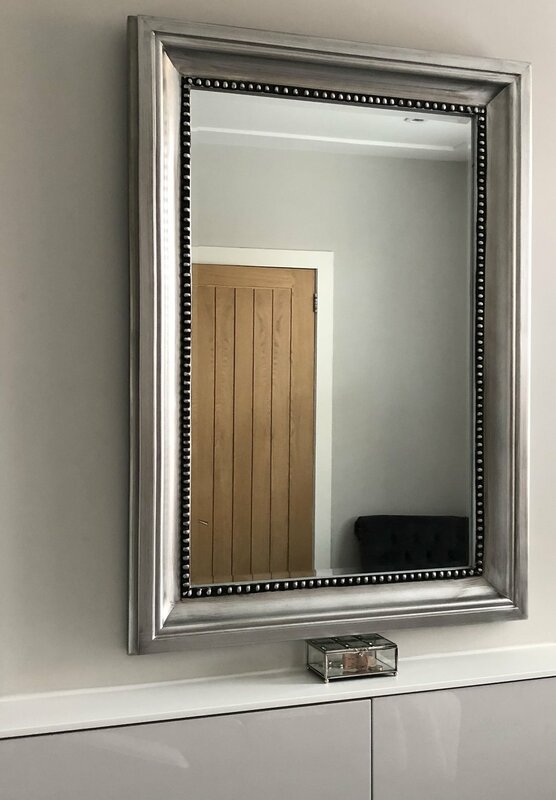 Grey, white and wood was used throughout the room so that colour could be added. Bespoke cabinets were handmade and sprayed to Farrow and Ball Dimpse, with a white Corian worktop covering one side of the room. Creating a ‘homely’ look so that the clients could relax completely was our focus. ‘ Relaxation is a key element of a facial treatment’ Reju-u. The facials rejuvenate and create healthy glowing skin - we wanted the room to reflect this. An ornate mirror attached to the wall makes the room feel twice as big and bounces light from the nearly full height window, giving the therapist the maximum amount of natural light possible. A cosy corner with an armchair, throw and frames on the wall for added comfort for the client and/or another guest. Being asked to design a room in the beauty industry was an exciting concept that we had never done before, the finishing touches were so much different to that of an office, restuarant or classroom which we are used to. However we loved the challenge! 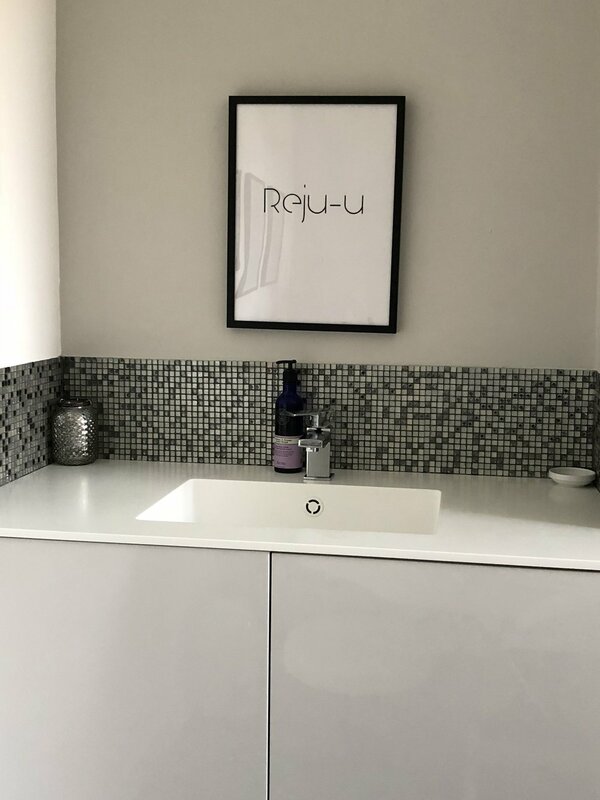 r4 and Reju-u are extremely happy with the results and the clients love it! We have completed the extension and fit-out! The clients brief was to create a flow between the existing restaurant and the new extension and to facilitate a growing number of tenants who use the area. We wanted to create a modern, fresh and slightly raw concept that also felt spacious and warm with the acoustics being just so and I believe we definitely achieved this! The flooring - Aged Indian Apple, a strong favourite and a classic sweeps throughout the whole area. This was used in the existing restaurant and still looks as good as new so there was no question about changing the flooring we just extended it! 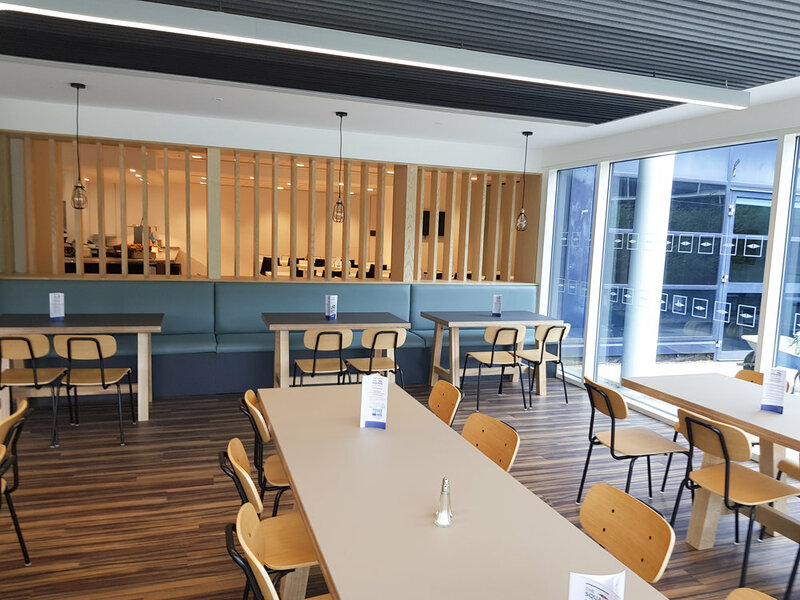 The refurbished area is large with high ceilings, a full glass front surround and busy at midday, so the acoustics were a big factor in the design. 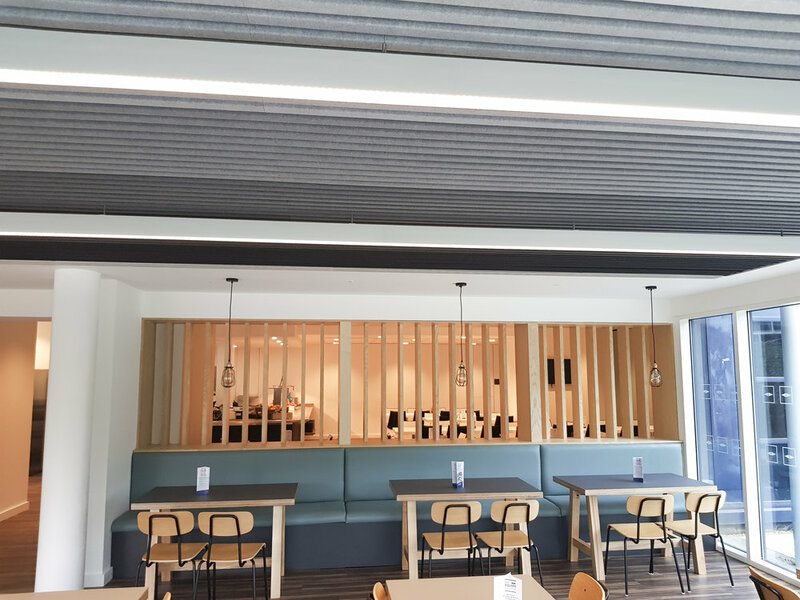 We have used acoustic noise absorbing Heartfelt Ceilings which are suspended from the ceiling, using the tones of the fabric to get lighter towards the glass thus making the room appear even bigger and lighter. Minimal colours were used as we wanted to keep the design looking timeless and contemporary for years to come however also with a natural feel for the tenants to connect to the outside world even on the coldest of days. We used raw materials throughout where possible with such an emphasis on the world and the products we all use, we are being plastic conscious and using recyled goods where possible. We love seeing our designs and fit-outs working for our clients and being used to it’s fullest potential. The Square is already being used for multiple functions including their big monthly mingle, serving breakfasts and lunches - we’ll be popping in for sure!